Miss Fisher’s Murder Mysteries is an Australian series that just appeared on Netflix and Amazon. Season 1 is available on Netflix, season 2 is currently airing in Australia. Miss Fisher’s Murder Mysteries takes place in 1928 Melbourne. 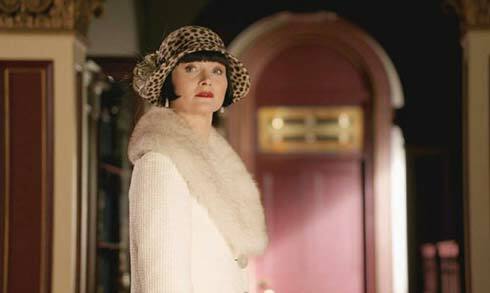 Essie Davis is Phryne Fisher, a feminist and free spirit who becomes a detective. The music, the sets, and the costumes are delightful, as are Phryne (pronounced fry-nee) and the people around her. Phryne is bold and clever and a couple of steps ahead of the police in solving crimes. Other major characters are Nathan Page as Detective Robinson, Ashleigh Cummings as Phryne’s maid Dot. (That’s her in the photo at the top.) Tammy Macintosh is Phryne’s doctor friend (a woman doctor in 1928!). A couple of characters who run general detecting type errands and drive Phryne around are played by Travis McMahon and Anthony Sharpe. The series airs in Australia on ABC-TV. It’s on Facebook.